Chicago-based emerging artist Tony Lewis had his work debut in a Sotheby’s New York auction on May 15, and sold a large-scale drawing for seven times the pre-sale estimate. 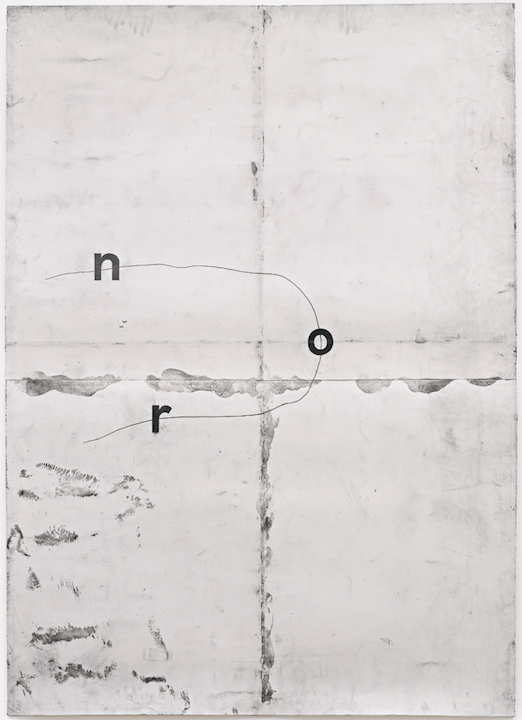 “Ron,” from 2012, was listed at $8,000-$12,000, but nine bidders fought until the artwork sold for $93,750. Unfortunately, neither the artist nor his local gallerist, Shane Campbell, will profit directly from this sale because “Ron” was sold on the secondary market by its previous owner, private collector Adam Sender. How did such a young artist make such a big mark in a playing field that is usually reserved for dead painters and Jeff Koons? Sotheby’s Midwest senior vice president Gary Metzner said that Lewis’ “stars aligned,” as he was in the 2014 Whitney Biennial, shows at a popular gallery and was in a well-known art collection—even if its owner flipped the work potentially too fast. “We put the work at a conservative level because we were testing the market,” Metzner says of Lewis’ auction debut. “A lot of people are looking for the next hot artist,” he said. “Hopefully Tony is inspired by the interest in his work.” Metzner could not say who purchased Lewis’ artwork from the auction. “Ron” is titled after artist Ron Ewert. Three new contemporary art venues sealed the deal to operate within Mana Contemporary, the 300,000 square-foot art complex in Pilsen. Ordinary Projects is a newly programmed space within the artist studio of Industry of the Ordinary, a collaborative art duo. Ordinary Projects has a three-pronged approach: exhibitions, a summer school and community programming, says Meredith Weber, who programs the space. “We wanted to create a space that doesn’t have any rules,” she says. (Weber formerly co-curated the Happy Collaborationists venue in Wicker Park.) The first exhibition is a solo show by Macon Reed (May 30 through June 22). The summer school is now open for enrollment to the first twelve people who apply. The cost is $500 to spend a few weeks being mentored by Industry of the Ordinary, who otherwise teach at Columbia College. Artists at any level of their career can apply for the summer school. Also newly opening within Mana is a residency program operated by the Propeller Fund, which provides annual funding to local art projects that engage the public. The residency runs for one year and is given to grantees of the fund. Two projects have been chosen to use the residency space: Multiuso, an all-female group of art educators who address the topic of gentrification in Pilsen, and Radius, a radio broadcast program for sound artists. Propeller grant administrator Abigail Satinsky calls the residency an incubator for these artists’ ideas. The third space to open in Mana is a satellite venue for the Chicago Urban Art Society, which is now accepting proposals for all types of art programming, to be judged by a panel, for its 2014-2015 season. The Art Institute of Chicago has ended a fourteen year-old lecture program called “Artists Connect,” in which Chicago-based artists were invited to speak about an artwork in the museum’s collection, and how it relates to their own art practice. Formerly titled “Metropolis,” the series was founded in 1999 by museum educator Clare Kunny, and in recent years Annie Morse administered it. Approximately one-hundred artists participated over the past fourteen years. Lecture programming will not likely expand at the museum until the vacant job of director for lectures and performance programs is filled. Meanwhile, some onsite artist lectures are offered by other museum departments and SAIC. Additionally, Kirshner has overseen the implementation of the museum’s first artist-in-residence program. Artists who participated in the “Artists Connect” series included Theaster Gates, Joyce Owens, Industry of the Ordinary, Lou Mallozzi, Julia Fish, Ed Paschke, Anne Wilson, Dawoud Bey and many others. Some of the lectures are archived as podcasts on the museum’s website.